Around the world, a growing number of people are speaking out against mandatory vaccinations. 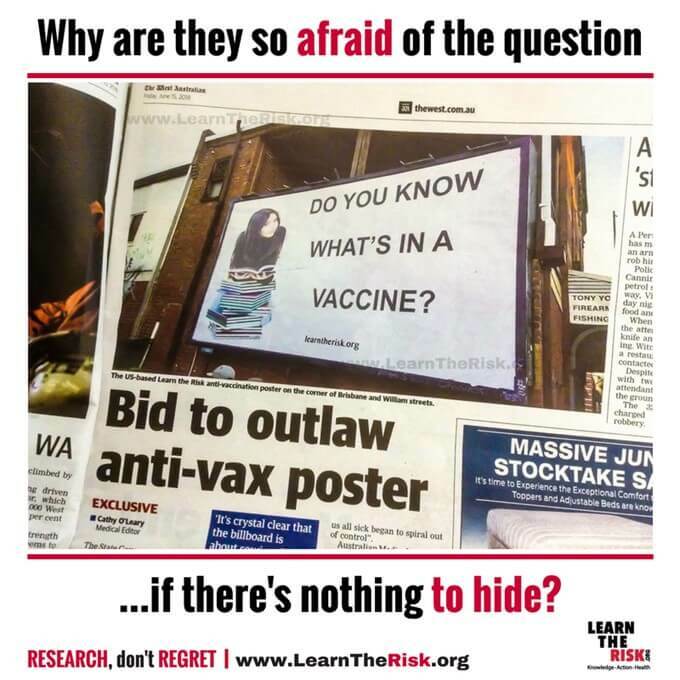 There have been protests in Italy, the US and Poland; picnics in the park, held on behalf of vaccine injured children in England; and a billboard put up in Perth, Australia, asking people whether or not they know about vaccine ingredients. These activities alone demonstrate the level of anger and frustration being felt about mandatory vaccination and the threat of mandatory vaccination around the world. One professional who has become an expert in her own right when it comes to speaking out against mandatory vaccination is Ms. Sallie O. Elkordy. Since she compiled this list in 2015, further documentaries, including Vaxxed: From Cover to Catastrophe, Sacrificial Virgins Part 1, 2 and 3, and Deadly Deception: Exposing the Dangers of Vaccines, have also been released. These documentaries and many more have portrayed just how serious an adverse reaction to a vaccination can be. Many of them tell the story of seriously injured children whose have lives have been changed forever. To read the document that Elkordy has referred to, read Dismantling House Resolution 327 by Amandha D. Vollmer, BSc, HHP. For the above reasons, a group of Australian volunteers known as Let’s Talk About Vaccines have decided to air their concerns in public. In a rare move, they have invited six of Australia’s leading independent vaccine experts to speak about vaccination safety at the 2018 Sydney Vaccination Conference on June 30, 2018. They have asked The Liberty Beacon to publish the following press release, which advertises the event. Australia’s top independent vaccine experts will be speaking. The 4-hour conference is organised by volunteer group Australia Let’s Talk About Vaccines. Tickets are available on eventbrite. vaccination of people and animals. “The public is entitled to know the risks of vaccination because this is a medical procedure, and as such informed consent of both the risks and benefits is required by law. This should not be dismissed as anti-vaccination as all medical products and procedures need to be assessed by those receiving them. Dr. Wilyman is an expert in her field. She has completed an extensive thesis through the University of Wollongong, A Critical analysis of the Australian Government’s rationale for its vaccination policy. This research covers every aspect of both Australian and worldwide vaccination policy, and the pharmaceutical company influences that you MUST be informed about! Brian Martin is an emeritus professor at the University of Wollongong, Australia, and vice president of Whistleblowers Australia. He is the author of 17 books and hundreds of articles on dissent, scientific controversies, nonviolence, democracy, education and other topics. He will be speaking on his new book, Vaccination Panic in Australia. In 2009 in Australia, a citizens’ campaign was launched to silence public criticism of vaccination. 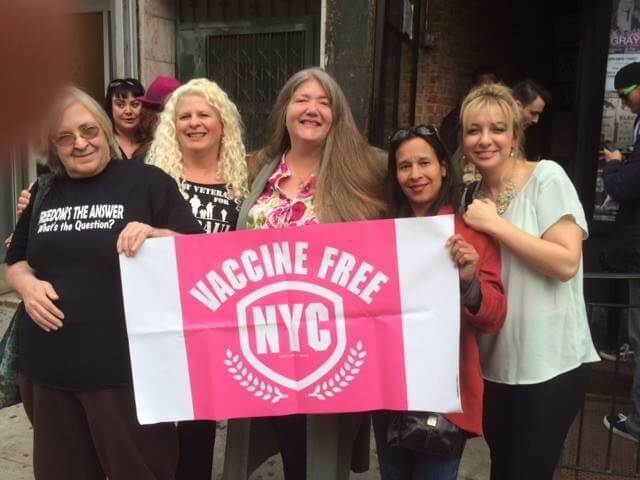 This campaign involved an extraordinary variety of techniques to denigrate, harass and censor public vaccine critics. It was unlike anything seen in other scientific controversies, involving everything from alleging beliefs in conspiracy theories to rewriting Wikipedia entries. Vaccination Panic in Australia analyzes this campaign from the point of view of free speech. @LetVaccines – using #SVC2018 to keep the conversation going.